NOT A GLUTEN FREE product 40 Freshly baked Macarons with up to 15 flavors . This 3 tier boxes in include 40 Macarons Total. 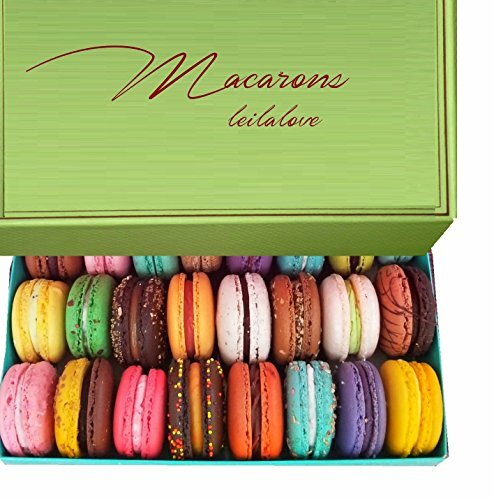 small box includes 8 Macarons , meduim box has 14 Macarons and the Large one has 18 Macarons . This 3 tier boxes in include 40 Macarons Total. small box includes 8 Macarons , meduim box has 14 Macarons and the Large one has 18 Macarons . A perfect Paris souvenir - delicious, Fresh and Fancy. Macarons are baked per order , wrapped individually in their own bags to keep them fresh and prevent them from cracking and breakage.